Retail advertisers helped commercial radio record its highest-ever ad revenues in 2016, up 5.4% year on year to reach £645.8m. The fourth quarter of the year was also a record, growing 7.7% year on year to £181.1m, beating the previous highest fourth quarter of £168.4m in 2003, according to official figures from commercial radio trade body Radiocentre. Radiocentre said growth was fuelled by a 90% uplift in spend by online retailers, from £6.5m in 2015 to £12.4m in 2016. Nielsen figures show that eBay increased spend in radio by 600% to £5m in 2016. The retail sector as a whole increased spend in radio by 2% to £80.8m. retained its position as the biggest UK radio advertiser, investing £19.4m in 2016, according to Nielsen. 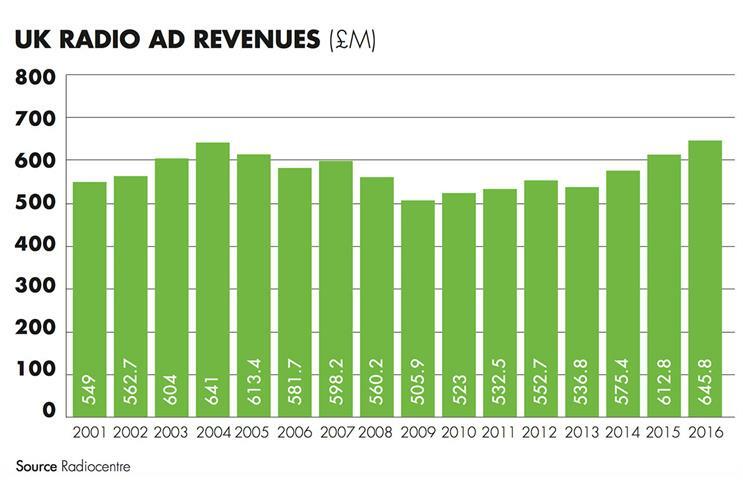 Ad revenues in radio fell between 2004 (when it was £641m) and 2009, when it hit a low of £505.9m. Since then, the sector has been growing steadily apart from a dip in 2013. In 2015, brands spent £612.8m. Mike Gordon, chief commercial officer at Global Radio, which owns Heart and Capital, said this is "far more of a momentum rather than a flash in the pan". He believes the upward trend will continue in 2017. Gordon agreed that growth was the result of a rise in retailer spend and that digital brands such as Amazon have boosted the category. Another factor, he added, is that more brands are opting for an "always-on strategy". The outlook for radio compares favourably with that of TV. ITV forecast spot revenues to decline by 6% in the first four months of 2017, compared with a 3% drop in 2016. Lauren Croly, head of audio investment at MediaCom, said the radio market "doesn’t seem to be slowing down" this year. She added: "The emerging impact of digital audio and the abundance of creative and flexible trading opportunities it offers, along with consistent radio figures being delivered Rajar after Rajar, have reinvigorated interest around radio advertising." Radiocentre chief executive Siobhan Kenny pointed to more than 20 new DAB stations that launched last year, which she said are offering more choice to listeners and advertisers. targeted top marketers, including Unilever’s Keith Weed and Airbnb’s Jonathan Mildenhall. 1 Focus on building weekly reach over frequency to optimise results. 2 Use or develop consistent brand audio assets to drive recognition – for example, music, voice and strapline. 3 Consider how you will measure radio’s effect within the media mix. 4 Think about how your ad will stand out in a crowded ad break. Distinctive casting, a change of pace, a pithy punchline or well-timed silence can help your ad be heard.